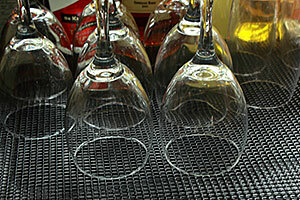 The latest StayPut PER®formance non slip shelf liner is designed for use in bars, cafes, restaurants, hotels or where glasses are stacked on shelves or for washing and draining areas. 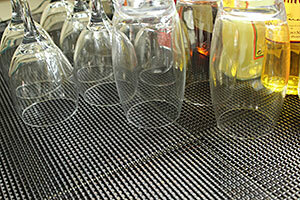 The non slip shelf liner is 1.2mm in depth, slightly raising the glasses above shelf level. This helps prevent chipping and allows glasses to dry quickly, by increasing air circulation and ventilation. The matting is easily cut to shape and length, washable at temperatures up to 120 degrees. Per®formance shelf liner is Oeko Tex Certified to Standard 100 for skin safety, Food Grade Standard and complies with the EEC Rohs and Reach regulations. It is fire resistant and UV stable so even if the shelves are in direct sun light the matting will not discolour. If a size is required that is not listed in the table beneath please contact us as bulk rolls can be cut to various widths.